The year appears to be speeding up and we are already at the end of term 4. We have had another term full to the brim of fun and learning. The children have really engaged in our enquiry topic this term ‘How are Bristol and Nairobi different?’ and have been fascinated to find out the continents of the world and we have begun to look at the different landscapes of Africa. We by began visiting Victoria Park and looking out across the Bristol skyline to observe our own landscape and features. We have enjoyed reading the picture book ‘Handa’s Surprise’ by Eileen Browne and have written our own versions of this tale to share with Reception classes. As this has been a short term we will be continuing this enquiry after the Easter holidays. Our favourite literacy day was celebrated this term -World Book Day ! Year One seized the opportunity to dress as their favourite book characters and we enjoyed sharing our most popular tales. We particularly enjoyed a story telling workshop and identifying famous Julia Donaldson tales from props. We also visited Bedminster library for a fantastic re-telling of The Tiger Who Came to Tea. The library staff were very welcoming and had made bookmarks for the children. All pupils especially enjoyed exploring all the books on offer and choosing their own to read. This term saw the return of the House Gymnastics competition. It was the second year that Year 1 had participated and they were amazing. Two children from each house represented their class and their scores were combined with Yr3/4 and Yr5/6 results. This year the winning house was Stephenson. In numeracy this term we have continued to work on securing our number facts and the weekly quiz is helping us to improve our recall of these. We are now working hard to know all of our addition and subtraction facts by heart within 10. If you are looking for activities to practise at home continue letting your child use coins and money when out shopping and regularly ask them to read the time to the hour / half hour. This term we also to enjoyed a play performed by the visiting Travelling Light Company which brought to life the traditional fables of The Tortoise and the Hare and The Sun and the Wind among others. Pupils were enthralled by a live performance and the actors kindly agreed to a meet and greet session after the performance where the children were able to discuss the plays and ask questions. Perhaps the biggest highlight of the term was science day. Full of hands on activities that promoted our curiosity, observation and evaluation skills. Oak class experimented with shadows whilst Willow investigated marble runs. The children were totally engaged all day and their scientific reasoning and evaluation progressed dramatically over the course of day. We concluded the term with an egg decorating competition and all the entries were fantastic and it was clear how hard the children had worked preparing them. Have a restful Easter and we look forward to hearing about your adventures next term. 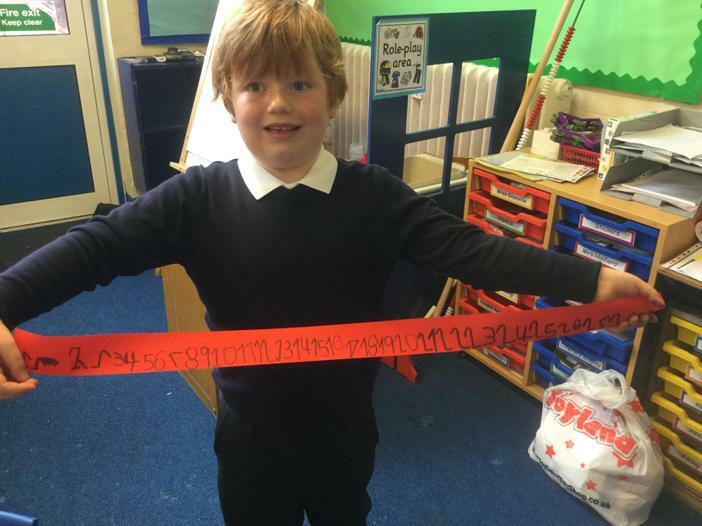 Traction Man parachuted into Year One this January and has dominated the classroom and our learning ever since. 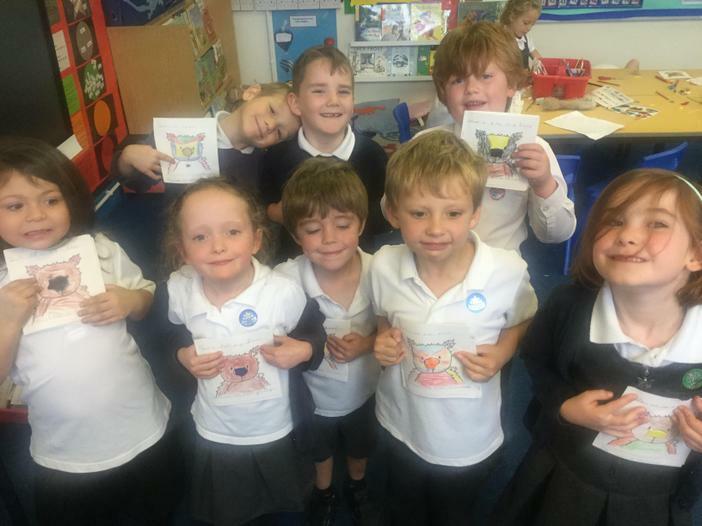 The children have really enjoyed reading about his adventures using the picture books by Mini Grey and they have created their own action adventure stories. Our enquiry this term was looking at how toys have changed over time. We began with a wow day exploring modern and old toys. Over this term we have focused particularly on how Dolls, Teddy Bears and toy vehicles have changed since our grandparents were children. 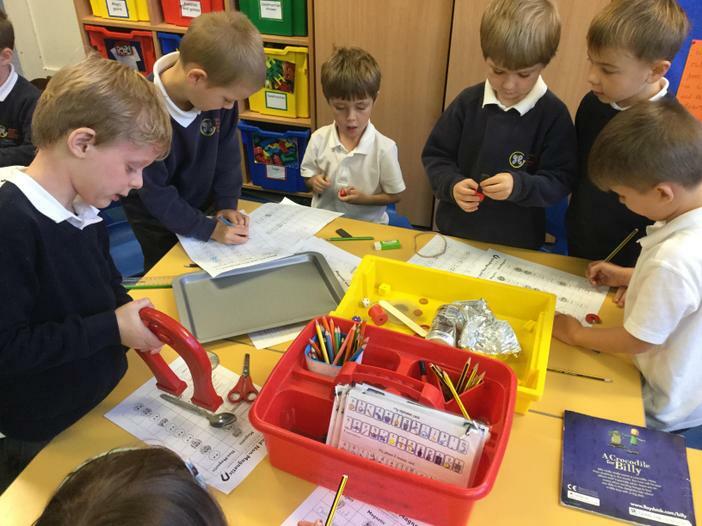 We looked at how the materials used have altered and how the invention of plastics and electronics revolutionised toys. In indoor PE sessions we have explored dance, gymnastics and games as toy dolls, robots, teddy bears and traction man himself. Despite the wet weather we have continued Forest Schools over the winter months and would like to thank our fantastic team of parent helpers who have made this possible. The children have enjoyed making bird feeders, jumping in muddy puddles and observing the seasonal changes so far this year. A warm cup of hot chocolate has also proved popular on chilly afternoons. Kept an eye on the displayed forest school list to check if your child is going to the next forest schools session. We began the term with a lovely community day thinking of others. We were visited by Natalie from the Marmalade Trust, a charity supporting lonely people in Bristol. She told us about how the Marmalade Trust brings people together on Christmas day who would otherwise be alone to share the festivities. We made personalised Christmas cards to be given to those attending. 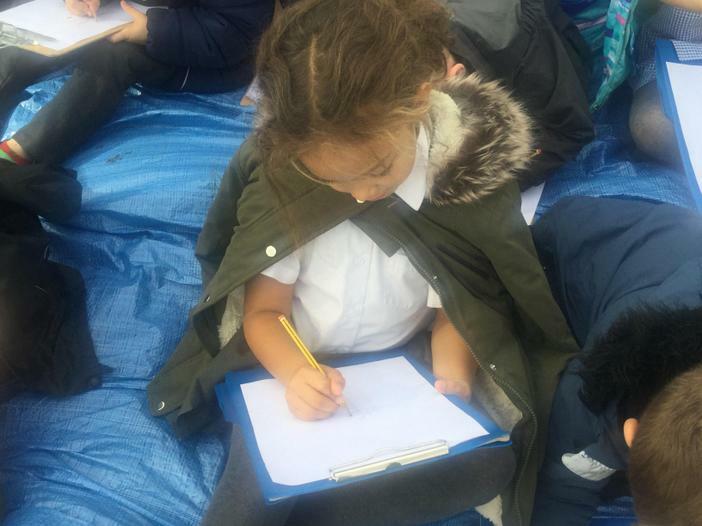 Our enquiry was ‘ How has Victoria Park Primary School Changed?’ We began by being history detectives looking around our school buildings to discover which parts were old and which parts were modern. 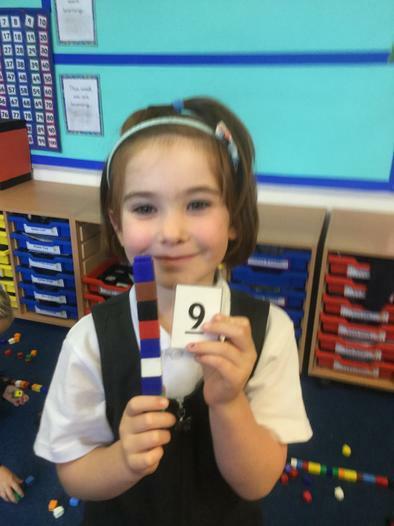 We were very excited when we identified the chimney on the school roof which led to our classrooms! We examined historic maps of our local area and were excited to learn when our homes appeared. We found out what school would have been like for the first Victorian children who would have sat in our classroom. We were all shocked at how strict the teachers were and didn’t like the idea of the dunce’s hat or the cane. For our challenge we re-designed our classroom to look like a Victorian Classroom by covering all the displays and re-arranging the tables into rows. Then we all came to school dressed as Victorian children for a Victorian Classroom Experience. The girls and boys were taught separately and we had to work in complete silence. We all enjoyed this experience although most of us preferred our school how it is today! In early December we visited Blaise Castle House Museum. At the Museum we enjoyed exploring the Victorian toys that children from the past would have played with. We had the chance to sit in a real Victorian classroom and spotted the dunce’s cap hidden behind the teacher’s desk. Later we participated in a Victorian Christmas workshop where we explored the foods in a Victorian Christmas dinner, unwrapped traditional family presents, prepared a Christmas Pudding and made festive decorations. It was a fully packed day of adventure and the children’s behaviour was impeccable. In our penultimate week of term Key Stage 1 performed the Nativity as our Christmas production. It was a great performance and all the children sang beautifully and looked amazing in their costumes. We concluded the term with an amazing carol service at St. Michael’s and All Angels Church. It was great to see so many parents sharing the festive celebration with us. Wishing you all a very Merry Christmas and we will see you in the new year. What a fantastic start to the academic year we’ve had! We have packed in lots of learning, laughter and fun. The children have really enjoyed our ‘That’s Not My Bear’ enquiry. We have learned to retell the Goldilocks and the Three Bears story and have written our own versions of this traditional tale. 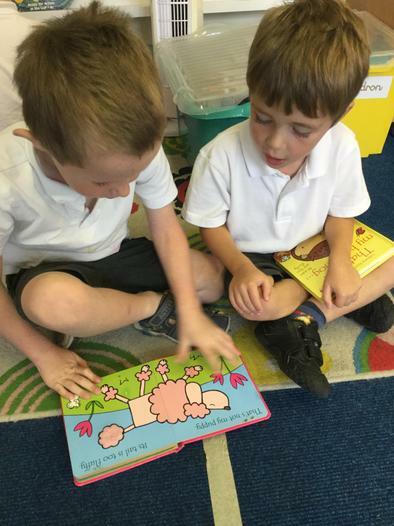 We have also enjoyed sharing a variety of favourite stories from school and from home at the end of each day. 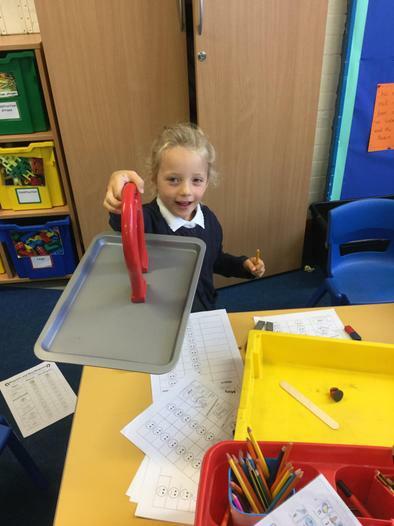 In our science sessions, we have analysed different materials and have examined the properties of these. 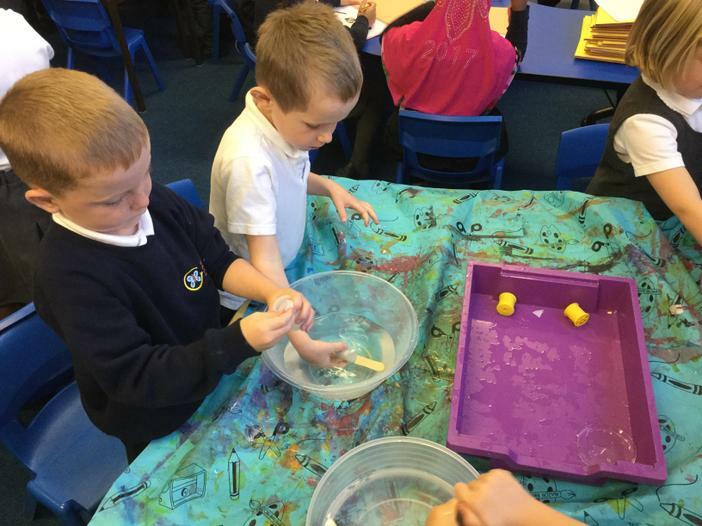 We have also conducted our own investigations into which materials are magnetic, buoyant and waterproof. 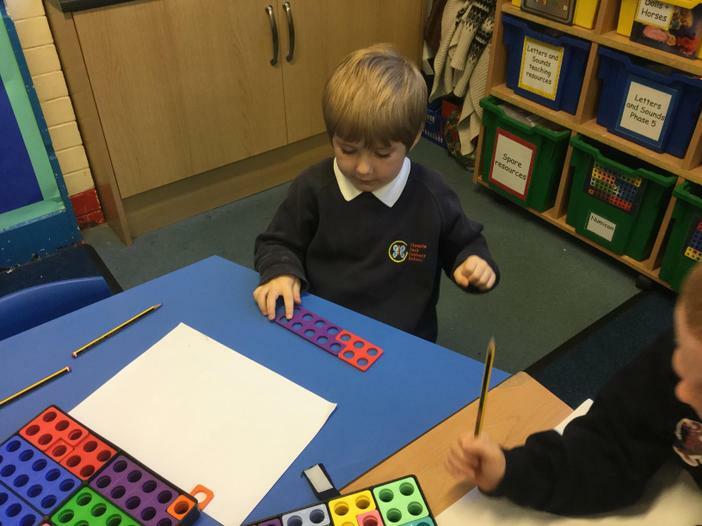 We have used this knowledge to group and sort materials. 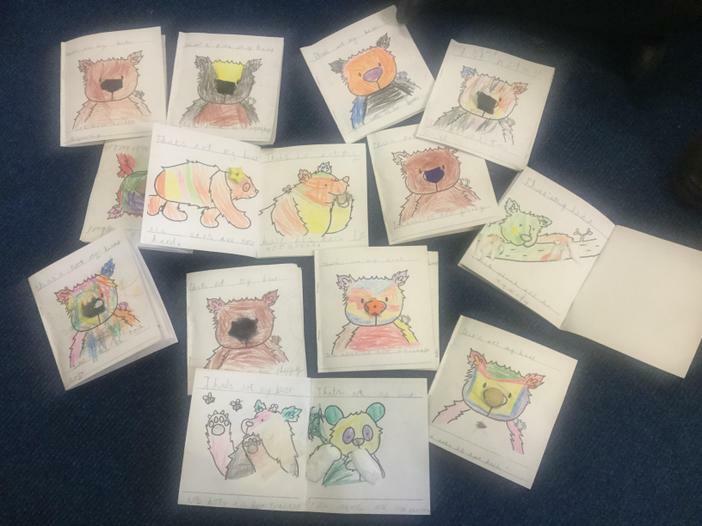 As our challenge task we have made our own versions of a ‘That’s Not My Bear’ book using a range of materials and wrote a description about each of their properties. We think you’ll agree that they are just fantastic ! Half way through the term we participated in Art on the Hill trail and enjoyed a week full of art activities: printing, model making, painting and drawing. 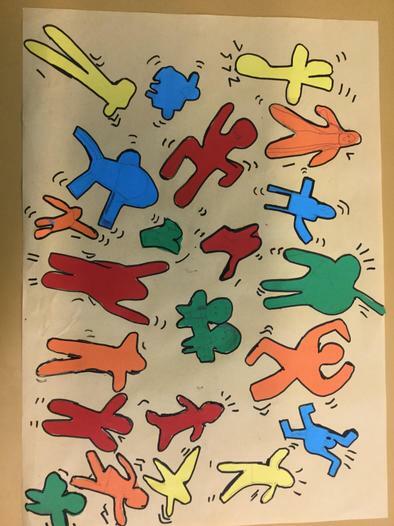 As part of our faces and figures focus we explored various artists including Picasso, Haring and Warhol. Our Picasso cubes looked amazing in the final whole school display and it was great to see so many pupils and parents joining us for the arts trail. 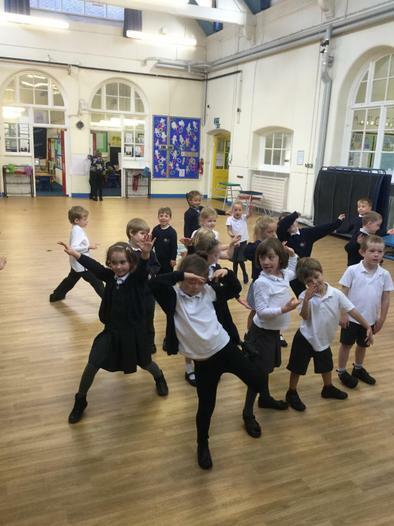 Here we are throwing some shapes to 80's music to inspire our Haring figures. 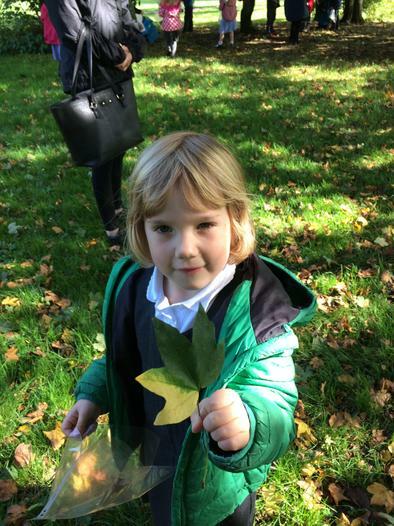 Over this term we have visited Victoria Park in the afternoons to find out what happens to trees and plants in the Autumn. 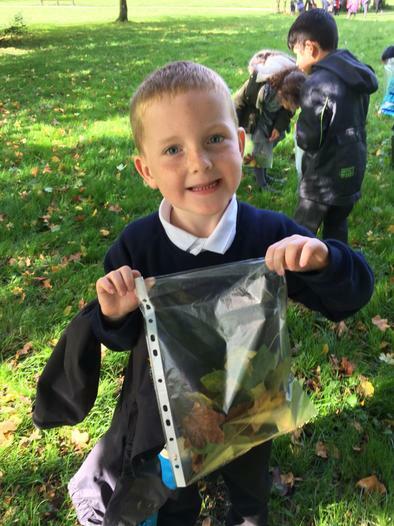 We collected leaves to make our very own autumn windows and leaf hedgehogs. We were fascinated with the various colours of the leaves and enjoyed an outdoor art lesson on observational drawing of trees. Forest schools will continue in groups over the winter months. 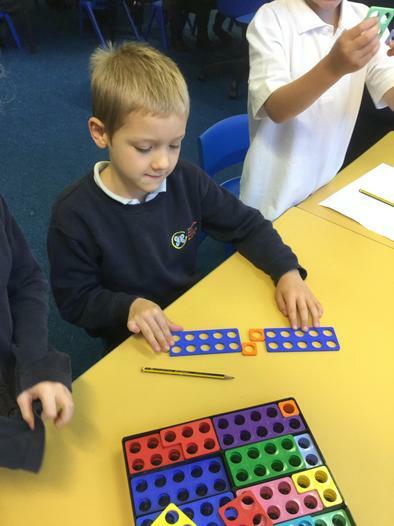 In maths lessons this term we have deepened our understanding of teen numbers, number facts to 10, addition, 2d and 3d shape. 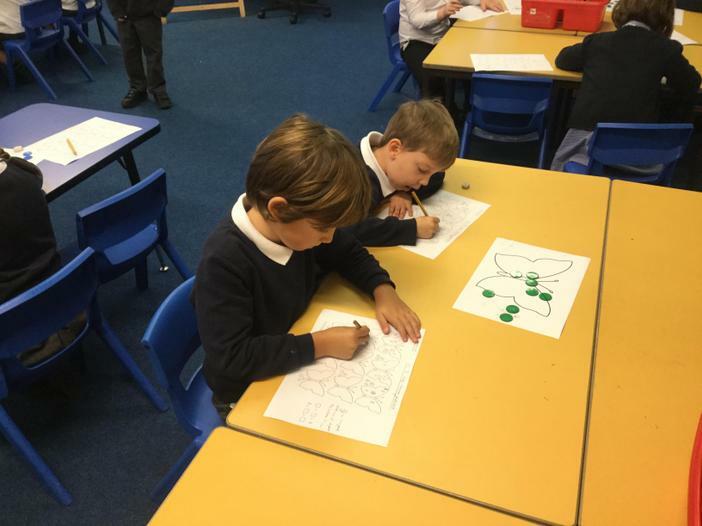 We have also enjoyed a variety of mathematical investigations and puzzles. These have really got us exploring number, generating our own hypothesis and explaining our own mathematical thinking and understanding. Year 1 particularly enjoyed participating in the House Cross Country competition in October, we loved it so much we ran twice ! Thank you to all the parents and carers who came to support us, it was a lovely event with a great community feel. We concluded our term with a fantastic performance at St Michael’s and All Angels church for Harvest Festival. We hope you enjoyed our Year 1 solo of Big Red Combine Harvester and wish you a great October half term !